TAC-FORCE introduces its new Southern Pride themed spring assisted folding pocket knife. 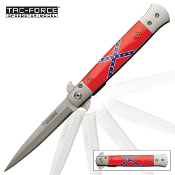 It features a durable handle with a Confederate Flag design. It has a 3 3/4" stainless steel blade with a satin finish and is 5" closed. For your convenience, it also has a pocket clip.